Mike and Sarah both have huge hearts. Their relationship blossomed long distance as they each served on ministry trips in Cambodia and Africa, respectively. Now that they're married, they can serve and love those around them as a team, happily ever after. Read on to learn more from Sarah! Mike and I worked together at the same non-profit organization called Youth With A Mission, Denver. Mike began pursuing me while we were in this program together. I ended up going to Africa for three months and Mike went to Cambodia at the same time for a ministry trip. We kept in touch and soon after that we started dating! 6 months later we got engaged and then 6 months after that we got married! Mike never stopped pursuing my heart from the day he met me till the day I became his wife. Our wedding day was truly a dream, and the best day of my entire life! Our theme was rustic/chic. The day was complete with twinkle lights, sunflowers in mason jars, log cutouts and baby's breath. We were married outside under an array of sunflowers with the Rocky Mountains painting the background! The reception was in a huge red barn, with of course, more twinkle lights! We sat down and thought of the big things that were important to us. Sunflowers, lots of dancing, good food, and a big red barn! Everything else just came naturally as we began to plan from there! We had all the guests sign in on a big piece of wood, which was something we wanted to be able to hang up in our house later! During the ceremony we had the guests sit on wooden benches on the grass, which just added to the rustic/country style. My favorite memory was all the dancing! We had 170 guests and almost EVERYONE was out on the dance floor. 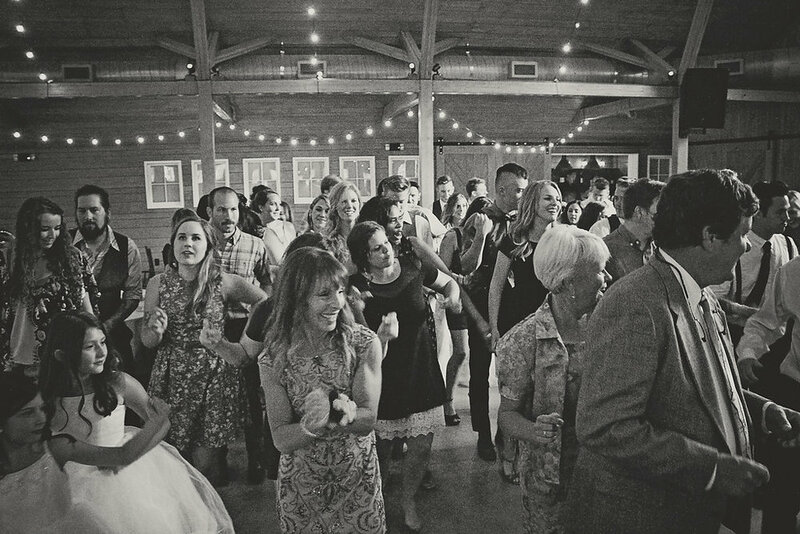 We really wanted our wedding to be a party, and to be fun for everyone and it sure was! That is so much of our personality: carefree and crazy! That definitely carried out on to our guests. I learned to manage my time a little bit better. Really schedule out everything you need to do, so that the last week before the wedding you can just relax and be with family! Enjoy every moment of the planning! You will never be able to plan a wedding again and it's such a special time, so enjoy it! Spread your to-do list out so you aren't rushed or stressed and so you can soak in the little details. Planning the wedding was one of the most fun/exciting parts for Mike and me. Marriage is truly a gift. Take in every moment of your wedding day, and don't waste time being stressed out or anxious. You are marrying the man of your dreams, so make your wedding day your dream day!